WHAT DO THESE TWO FIREARMS HAVE IN COMMON? 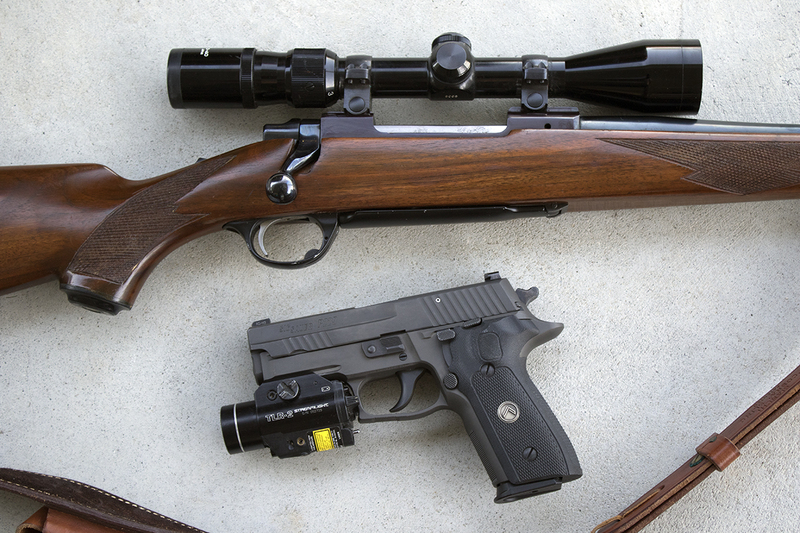 Above, we see an excellent hunting rifle and an excellent pistol, usefully accessorized. What does a classic Ruger Model 77 .30/06 with 3-9X Williams Twilight telescopic sight have in common with the SIG Legion P229 9mm and a TLR-2 light/laser attachment? Each, obviously, can improve the shooter’s accuracy, particularly in poor light. But each has attributes which can be life-saving in responsible hands, and life-threatening in irresponsible hands. Many of us have run across the Slob Hunter who uses the scope on his loaded rifle, instead of binoculars, to scan for game, thus recklessly crossing every human being who comes into his line of sight. None of us want bozos like that walking around with guns. We have to realize that a WML (Weapon-Mounted Light) puts us in exactly the same irresponsible position when we use the light on a loaded firearm for searching. That’s why the hunter needs binoculars, and the home defender needs a separate flashlight for searching. At the same time, we will never know how many lives have been saved when at oh-dark-thirty coming out of the woods on the last day of hunting season, a hunter thought he saw a deer but stayed his trigger finger when the magnified image in his riflescope showed him it was a human instead. Similarly, we’ll never know how many lives have been saved when at the last desperate second, the WML showed a cop in the dark alley or the householder in the darkened home that the thing in the beam was not a deadly threat which needed shooting, after all. One of the myths it falls upon all responsibly armed citizens to “bust” is the old “I’ll kill any stranger I find in my house!” Yes, your home is your castle, but that doesn’t mean you’re allowed to have an execution chamber. …and killed her own adult daughter, who was coming unannounced to “surprise” mom and step-dad by arriving early for the holidays, having let herself in with her own key. And here’s another such that occurred in 2016. These things can happen more easily than most people seem to realize. The ability to positively identify a threat is absolutely critical, and it’s why a flashlight should accompany every home defense firearm. Even if that firearm has its own weapon-mounted light, we’re pointing a loaded gun at everything we look at, so there should be a separate flashlight for search and PID (Positive Identification) purposes. An excellent discussion of this issue can be found here. Pistol-forum.com is one of the very best, most informative sites on the gun-related internet, and there are many wise voices of experience in this particular thread. 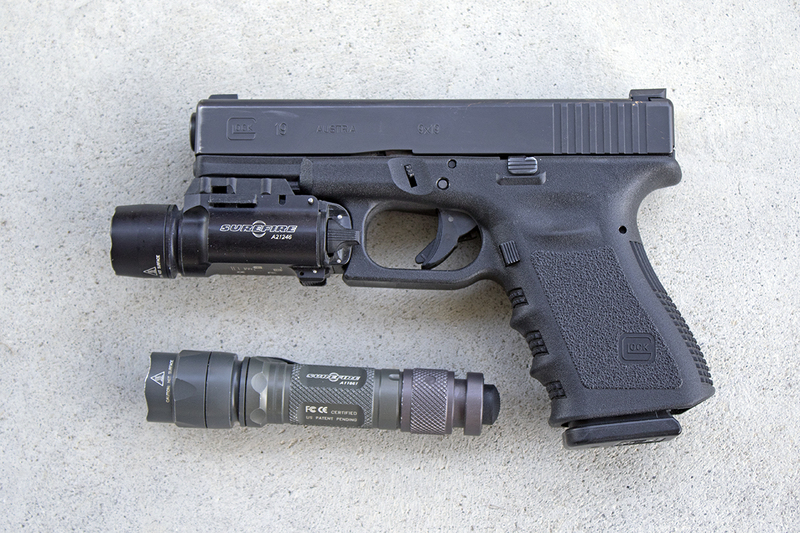 Author STRONGLY recommends that WML (like this SureFire X200 on Glock 19 9mm) be supplemented with conventional flashlight for searching, such as this L1 digital LumaMax, also by SureFire. What they have in common is that they are tools that require intelligent handling. No different in that respect from a chain saw, a hammer, or a stick of explosives. The skill and judgement of the user is what counts most. A life of a beautiful child would have been saved, by a simple Challenge…”Halt who goes there”, before dropping the hammer! So sad, my god rest their souls, both Mom and Deceased Daughter! I favor pistol caliber carbines for home defense due to their low muzzle flash and blast. My primary bedroom defense firearm is a Kel-Tec Sub 2000 with a 17 round magazine for 9mm ammo. I have some 32 round magazines too but doubt that they have much application for home defense. They are fun at the range though! I have equipped my sub 2000 with both a red dot sight and a light / laser combo sight. They are off-set so as to still allow the sub 2000 to fold. The red dot is useful at the range for longer shots in the 50 to 100 yard range. The stock iron sights or the laser would be used at closer ranges. In addition to the WML, I have a small flashlight to use by hand. I have also mounted a motion sensor light at the foot of my bed to illuminate the bedroom doorway. If someone enters my house (would probably set off the alarm), then I can take a defensive position and cover the doorway. Anyone trying to enter would be illuminated by the motion sensor light while I would still be hidden back in the dark. If they shoot at the light, then that is OK because I will be elsewhere and ready to return fire. I agree with Mas that one should give a lot of thought to the use of light for home defense. I have tried to do so. I was beginning to think I was the only one who thought this. Having a light mounted to your gun as a civilian is foolish. Other than what Mas wrote, it makes a great target for an intruder. There is no way I would put a light on my gun. A weapon mounted light has more positives than negatives in my opinion. You don’t have to point a 150 plus lumen light at a particular object to light up most rooms in the average home. The ability to temporarily blind an intruder with the center of the beam while aligning the sights creates a huge tactical advantage. Lastly, a combination light/laser is good for rapid target alignment and allows you to dial your phone without sacrificing the gun/light/laser. Pistols, flashlights and lasers are all tools. If each is used appropriately and correctly, they can compliment each other. If used inappropriately, they can create real problems. Some firearms work better for some applications, same can be said for flashlights. Get to know your equipment and practice with each one. Go through “what-if” drills and see how each perform in various situations that you may likely be in. Don’t force a “square peg into a round hole”. Don’t force a pistol, flashlight or laser to do something it doesn’t do well, or effectively (or safely). I fully understand what you are saying and the reasoning behind it, but, and Mas may correct me, I don’t think he was condemning weapon mounted lights for civilian use, but rather, the correct use of such lights. Compact weapon mounted lights were just coming into vogue as my LEO career was winding down. As I was working straight day shift, I never really considered one. Like most large departments, Dallas did not allow them until our range personnel did extensive testing of those available, determining those that were acceptable and developing a training program in their use. As they were phased in, those working evening and deep night shifts were given priority for this training and were required to qualify with both the the light and the weapon it was mounted on. I never placed myself on the waiting list. Since retirement, I’ve experimented with weapon mounted lights and found them a very useful tool, mainly for four legged varmints around the homestead. I’ve eliminated many a pesky chicken thief at ranges up to and over 100yds with a good scope and mounted high intensity light on my .22 mag rifle, while at the same time being able to peruse the field behind the thief for friendly cattle. The same holds true for my shotgun w/light for armadillos and skunks at much closer range. I recently mounted my first weapon light on a self defense pistol. This pistol, probably scoffed at by many, but beloved by me, is my “N.E.A.T. gun” (my terminology) standing for “no excuses always there gun”. Yes, my little pocket carry LCP. With the unobtrusive trigger guard mounted light and seven rounds, it still weighs less than a pound, still rides unnoticed in my pocket, either by me, or intrusive eyes. It does give some abilities that were not available before, which, after much practice, also brings an additional degree of comfort. I also carry a high intensity flash light when out and about at night for the very reasons Mas alluded to. I proscribe to doing room to room searches in the home with a handgun and hand held light, rather than with a shotgun or rifle. The handgun can have a light mounted, but just because its available doesn’t mean it has to be used. Once a target has been identified, if engagement isn’t immediate, extinguishing the hand held light and using the weapon mounted light can bring a needed element of surprise from a position of cover. Amen to all that, Dennis! Do you recommend your model of .22 magnum rifle? It sounds effective. I believe that .22 WMR is legal for coyote here in Arizona, while .22 isn’t. I think that some restrictions may obtain regarding jack-lighting certain game, though, and I will research that. The sensitivity to light of the eyes of rabid animals can work for you. A Surefire LE 400-lumen also enabled me to herd a rattlesnake at night. Imagine trying to herd more than one at a time, though. I use a headlamp quite often at night, but I don’t know if I would want to wear one in a dark alley within a dicey venue. A weapon-mounted light is not “foolish,” in and of itself. At a specific moment in time, it can be a vitally important tool, whether one is appointed to hunt bad people, or is simply defending self and others. Training is important, so that one does not do foolish things. There is, of course, a true need for a reliable hand-held light, to be the “primary” light. Even better: two reliable hand-held lights, and a WML. I totally agree, the person with a finger on the trigger is 100 percent responsible where the bullet will go. Helps prevent tragedies, and stubbed toes. This is a phenomenal house rule. We have a similar rule which is “Turn on the hallway light when you leave your room”. Possibly yours is a little better as it identifies who in the family is out and about. Amen. Amen. Yes. What he said. Lights look cool but in my experience they lead to bad habits. This article goes especially for LEOs. And I hate it when ANYBODY points a high-intensity light at my eyes, because I can’t tell who is holding the light. Criminals are quite liable to tell you that they are peace officers. And some lunatics are liable to think that they ARE the law. And one-handed pistol use has to be a consideration if you are going to keep the non-weapon light in your off hand, which you probably often should do. And a light can tell an adversary where your hand is, which makes you especially vulnerable to a shotgun blast. For hunting, good used binoculars can be found for cheap. Of all the innovations and advances of the last half of my life, lighting has got to be at the top. My wife thinks I’ve got a fetish for flashlights, and I readily admit that is probably true. There is a good explanation though. When I became a police officer in late 1970, the department issued me a SW Mod 10 .38 spcl revolver, Sam Browne set-up, 12 rounds of ammo, and a Ray-o-Vac Woodsman flashlight. Forty seven years later, with all they advances in handgun technology, there is still an argument to be made as to the sufficiency of the venerable old Mod 10 for self defense. No sane person would argue in favor of the incandescent bulb flashlights of yesteryear over the flashlights of today. Walking the alleys in hopes of catching a burglar in the act, searching a warehouse where a silent alarm had been tripped, or chasing a suspect through back yards with a flashlight that, at best, illuminated dimly only a few feet in front of you, instilled a desire for something better. Human reaction time begs for it. It was very easy to outrun your light into a kill zone, becoming a target before you ever saw the threat. Modern technology has brought us hand held lights that are not only thousands of times brighter, infinitely smaller, but also, unbelievably affordable. Barrels of ink has been dedicated to what weapon is best for every conceivable scenario imaginable. What caliber, revolver v. semi-auto, shotgun v. rifle, etc. Fact is, if you can’t see it and identify it, you are in deep doo-doo no matter what weapon you have. Do yourself a favor, spend a hundred on a better light before you spend a thousand on a “better gun”. Trust me, it’s an investment that makes a whole lot more sense. Dennis, your absolutely correct. It comes down to training, and preparedness. I’ve heard some say, by using a flashlight is giving your location away. I argued it’s far better to know who’s in your home, it could be any family member. It’s sad to say some people WON’T listen. In an earlier time you recommended conventional double action semi-automatic pistols for threat management and for that last layer of a long trigger stroke that could stay the shot in some cases. It would seem such a trigger system would still have merit especially when combined with the use of lights as described. Can you address this issue? RMc, a heavier and particularly a longer trigger pull for the first shot can mitigate unintentional discharges due to factors like startle response, but can’t eliminate them entirely. The force exerted by flexor muscles in the trigger finger when startled can easily exceed twenty pounds, far heavier than any double action trigger we are likely to use. Keeping the finger off the trigger is Plan A, but human nature being what it is, that can fail. The double action trigger pull is indeed one more safety net, but in the context of this particular blog discussion, the big take-away is don’t be pointing a loaded firearm at everything you look at. I heard a similar tragic story when a gun owner failed to identify his target before shooting. A young girl hid in her parent’s closet. She was going to jump out and yell, “Happy Birthday” when her Dad came home. He came home, heard a noise in the closet, and feared the worst. He drew his gun, opened the closet door, and fatally shot his daughter. I don’t think low light was involved, just too quick on the trigger, and failure to identify that target. I’d be interested if someone here would share the proper technique to investigate the “bump in the night” with a WML pistol and a handheld flashlight. It seems one will definitely have their hands full! For example, one hears a suspicious sound in their basement and investigates with their WML gun and flashlight. They scan the basement with their flashlight and see a threat in the distant corner. Should they then switch on their WML, give a “freeze” command while holding their pistol in low ready? What should one do with the flashlight once the WML has been switched on and the pistol is in low ready? Appreciate anyone who can offer experienced suggestions. My .22 mag is a Savage Model 93 base model (composite stock, standard barrel) that I bought at a pawn shop 20+ years ago. It turned out to be one of the most accurate rifles I own. Coyotes seldom run over 50-60 yards before folding with a heart/lung shot. When I retired, my co-workers gifted me with a Savage .17 mag outfitted with a 4-16×50 scope, stainless heavy barrel and glass bedded laminated stock. It’s very accurate too, but too pretty to use daily. I’ve since purchased a Savage “Edge” in .223 Remington. I must say all the Savage rifles I’ve ever owned have been very accurate straight from the factory. Steve, in response to the legality of shooting varmints at night, where I live now, it’s prohibited as a general rule (you can’t shoot them for sport at night). Exceptions are made for landowners shooting “nuisance animals” doing harm to property or livestock. I’ve made it a point to get to know and make friends with the Game and Fish officer responsible for our area. He knows the difference between poachers and folks protecting their property. He only asks that you give him a chance to deal with animals such as bears unless you have to take action immediately. Dennis: Thx for the info. I had a Savage .22 that was very accurate. A National Guard rifleman told me that his .223 was good to 1,000 meters. Nice to know that your G&F officer supports common sense. On my nightstand every night is an HK P30S (my EDC) with a Surefire X300 mounted to it, along with a handheld Surefire. I train with both. From the low-ready position, muzzle down at an angle, that X300 will illuminate any room in my house and a good piece of my yard. No need to point the gun for positive target ID in most cases. In the event I need a search beam, I use the handheld. Back in the olden days, I used a Maglite and trained on the various techniques outlined in Mas’ book “Stressfire”. A good WML just makes the task of target ID in the dark much less cumbersome. Thank you for some very timely thoughts. One more reason I have been a fan for decades. Peace. Dennis, I am in the same category regarding flashlights – my bride has given up trying to figure out why I need another when I already have one. I do confess to having a bit of a problem with flashlights, but explaining lumens to her is a lost cause, if it comes on, it’s GTG. But seriously, there can be nothing more tragic than the type of shootings described above. Everyone who buys a light for defense purposes should take training to learn how to use it – no different than buying a firearm. Maybe the answer to this lighting problem has already been provided by modern technology and our warriors in the Middle East. I’m talking about night vision goggles. Our warriors “own the night.” They go searching terrorist’s houses at night with night vision goggles. They don’t have to bother giving away their position with old-fashioned flashlights. Imagine being able to see your enemy, when your enemy can’t see you! Imagine how difficult it would be to find a sniper, using a rifle at night, equipped with a night vision scope and a sound suppressor. I guess, if we can afford it, we need to buy night vision goggles, put them on when we hear a bump in the night, and search our dwellings, stealth-style. And without mandatory safety training for every gun owner, how are these critical lessons supposed to be taught? For every owner who participates in forums such as this who, as as been demonstrated here, have at least thought about such issues there are hundreds if not thousands who legally own guns for home self-defense without any lick of training whatsoever. I don’t know what other states do, but Texas requires a hunter education course, which includes safety elements, in order to get a hunting license. But that’s for the use of guns in the pursuit of killing animals. Training for the use of guns kept in one’s home for the use of self-defense, i.e. killing people, zilch. Regardless of their “Training”, all that counts is Whether “They are Alive when the gun fight is Over”, and the Perp. is “Dead, or on the way to Jail, or a Hospital”!! But the whole point of Mas’ post is that sometimes the perp isn’t a perp. And much that Mas teaches is to enforce the point that you not only have to survive the encounter, but also survive the legal-and in this case, emotional-aftermath. We should not have to use the force that is government power to get adults to do the right thing. But you are correct, some people are too proud or too stupid to get the proper training. I don’t know what the answer is. Maybe the government’s rules on training would have to be approved by the NRA, or the people. I’m sure any checks we try to put on the government will be abused. The government doesn’t follow its own rules (the Constitution), does it? Maybe the government should use persuasion to get people to do things that are sensible. This has worked fairly well with cigarette smoking. Americans went from being 50% smokers to being 25% smokers. Maybe the government could produce Public Service Announcements to urge citizens to get firearm training, to wear their seat belts, to get fit and trim, to eat healthy foods, to stay away from drugs, to stay married, to value education, and to do a good job raising children. This way good values could be promoted without using the force of law. That would be a good way for a Republic to respect its tax-paying citizens. Persuasion, not force. Liberal Dave – Training is indeed extremely important. As Mas has pointed out, many times, a firearm is not a magic talisman. Its mere possession will not protect the bearer from harm. Like any piece of equipment, one needs to obtain the knowledge and skill necessary to use it properly before it becomes a really effective tool. However, making safety training “mandatory” before one can buy and own a firearm (for self-defense or any other purpose) raises many troubling issues. I can imagine anti-gun State or local governments deliberately making such training as expensive, difficult and time-consuming as possible simply as a means of discouraging firearm ownership. Even without the creation of deliberate roadblocks, some many find the cost and time requirements difficult to manage. Who would pay for the training? Would the government offer it for free? I doubt it. If not, then the cost becomes an additional barrier to ownership that would fall heaviest upon the poor segment of society that are already living paycheck to paycheck. Is firearm ownership only for the rich or middle-class who can afford the cost of the firearm, ammo and (now) mandatory safety training? Then there is the Constitutional issue. Despite the best efforts of some to wish it away, the 2nd Amendment exists and (as pointed out by the Heller and McDonald Decisions) does acknowledge certain natural rights. Would not a mandatory safety training requirement be an unconstitutional limitation upon the 2nd Amendment? Would not the cost be similar to the old “Poll Tax” that was once used to limit voting rights? Imagine (for a moment) trying to apply a mandatory training requirement to the 1st Amendment. One could argue that giving untrained citizens the right to say and write whatever they think is unwise especially in this age of the Internet. Suppose someone proposed a Law that before anyone could exercise his or her Freedom of Speech or Freedom of the Press, they must first take and pass mandatory training classes on Public Speaking, Creative and Critical Writing, etc. How long do you think the Courts would let such a limitation upon the 1st Amendment stand? In my book, all the Amendments in the Bill of Rights deserve respect. I do not put the 2nd Amendment into a separate, inferior category as so many Leftists do. If mandatory training would not pass constitutional muster for the 1st Amendment, then it does not do it for the 2nd Amendment either! In summary, I believe that we should do everything possible to encourage current or potential gun owners to obtain proper safety and defensive training. However, I feel that such training must, ultimately, remain voluntary. It should not be mandated by Federal, State or Local Governments as a condition of firearms ownership. purchasing a weapon, or, for that matter, universal training in the safe use of firearm. Firearm ownership and the un-infringed possession of them is after all an enumerated right of our constitution, why not make such education mandatory as part of public, private and home school curriculum? Of course it should be also required as a separate certification required to become a naturalized citizen. Training implemented this way would ensure that all U.S. citizens are properly trained, therefore proof of citizenship and a high school diploma or GED would satisfy your mandatory proof of firearm training for gun purchasers. Of course, the constitution places no educational requirements on enjoying the freedoms it guarantees. Are we going to restrict constitutional protections only to those who made it through certain levels of education? If a separate testing system is set up just for gun ownership, how are we going to handle those folks that liberal/progressives point to as historically doing poorly on tests, thus needing exceptions? Oral testing? Extra points for skin color or ethnic origin? Eliminate the educational requirement for those historically discriminated against? So, it goes full circle. With freedom comes responsibility. Some people are good citizens, some are not. As long as we live in a world of imperfect people, we will continue to have tragic accidents. Education is good. Restricting freedoms is not. One answer might be to offer voluntary basic firearms training by NRA-qualified instructors, possibly as volunteers, using range time funded by such entities as the NRA, VFW, Legion, etc. Lessons could be offered in 3 stages, beginning with dummy firearms, then blanks, then live fire on the range. One way to identify the doubtful firearm handlers. Wondering how often Mas needs to ask problem trainees to drop from MAG40 instruction, or how he otherwise deals with apparently questionable folks. Teaching when not to shoot obviously should be a major part of training. Steve, most of the folks coming to us have already had basic safety and firearms training, and ALL have to show us a concealed carry permit or other proof of having passed criminal record check before being allowed into the class. Having to remove students for safety violations, which we are very strict on, does happen but is extremely rare. Ironically, years ago, many high schools had Jr. ROTC instruction offered as part of the curriculum, complete with firearm training and qualification. Several Dallas high schools had indoor firing ranges complete with sand bullet traps. The liberal backlash against the military as the Viet Nam war progressed succeeded in getting this instruction removed from public schools. Training is hugely important but governments run by liberals would abuse it making the standards impossible to meet as a way to ban firearms. Convince your compatriots to quit trying to ban guns and then come back and post how that went. Perhaps the best answer is universal training whether you own a gun or not as suggested below. That would do wonders for militia preparedness. I am sure the NRA would be happy to help but would need some financial assistance. I could not disagree more with this statement. The SCOTUS was generally speaking of restrictions on the exercise of 2A Rights. It is a far more serious matter to deny them altogether. Of course, historically, rights have been withheld from certain classes of people (EX: Felons and those mentally ill). For example, the Right to Liberty is often withheld. A felon loses his liberty when he is sentenced to prison. A mentally ill individual loses his or her liberty when forcible confined into a mental hospital. Felons also may lose other rights such as the Right to Vote. Indeed, a felon may lose the most fundamental Right of all (the Right to Life) if he is sentenced to death for a capitol crime. It is reasonable and consistent, therefore, when the SCOTUS said that denying the Right to Keep and Bear Arms from Felons and the mentally ill was acceptable. However, denying a Right based upon education is a new and radical concept. Do we force citizens to take and pass a Public Speaking class before exercising their Right of Freedom of Speech? Do we force citizens to take and pass courses on writing and journalism before granting the Right of Freedom of the Press? Do we make citizens take and pass a course in Political Science before granting the Right to Vote? No? Then what makes it OK to deny the Right to Keep and Bear Arms until a citizen takes and passes a class on firearm safety? The fact that you think that such a thing is “reasonable” is an illustration of Left-wing ideology. Leftists have always seen the 2nd Amendment as an inferior and debased Right. Indeed, until the Heller and McDonald Decisions, most denied that the Right even existed or else claimed that it was some kind of vague State’s Right that granted nothing to the individual. It is not “reasonable” to grant or withhold access to a Constitutional Right based upon some educational requirement. Doing so would reduce the “Right” to nothing more than a “Privilege” that is being controlled by the Government. It would destroy it. Certainly, it would open a “can of worms” because Leftists would do everything in their power to use the educational requirement as a means to limit and, then, eliminate firearms ownership. To prevent the Left from using it as a tool to gut the 2A, the SCOTUS would have to dance around and invent all kinds of rules and limitations to define a limit whereby some amount of training and cost is OK but, go over the limit, and it becomes onerous and unconstitutional. In my view, basing access to a Constitutional Right based upon education requirements is flat-out unconstitutional at all levels. It is not “generally reasonable”. Mas, just off the top of your head, how many hours of home defense safety training would be needed to cover topics such as the one you raise here to at least a basic extent if safety training was mandatory before buying a firearm? Dave, that will take a while to answer. Let me address it in an upcoming blog post. I must admit to everyone that I am a bit of a flashaholic and the amount of lights that I have owned over the years probably comes in about two dozen, though currently I have sold or given away nearly all of the spare lights I have had over the years. But I am always still on the look out for the next light. One type of light I will mention and one I don’t know if anyone here has heard about is the Wrist Mounted Light. AFAIK this is exclusively manufactured by SureFire so I don’t know how widely they are available. It’s basically worn like a watch and when manually activated gives you a 15 to 300 lumen beam on your wrist while leaving your hands free for any task. When seeing it for the first time I thought of the Harries flashlight technique and how the Wristlight could give the same effect but gives the advantage of a two handed grip on the pistol. Haven’t heard much of the Wristlight concept that much but thought I’ll give it a mention and see what anyone else thought. Looks very good. I like the idea of a wristwatch-style light. I have practiced using a head lamp. I like it because not only can I identify the target, but my hands are free, and I can see the iron sights on my shotgun or handgun very well. Most folks don’t like the idea of a head-mounted light because it is easy for the bad guy to shoot at it and hit me. I am willing to take that chance if there are no better alternatives. I really should buy a night vision head set. It would be great to see the bad guy without letting him see me! American Justice? If a law abiding citizen makes modifications to a weapon to make it easier to fire accurately and is forced to use it to defend themselves from attack, that opens them up for prosecution. If a seven times deported illegal alien with several felony convictions steals a standard government issued double action/single action pistol that has a lighter factory trigger pull in single action mode, that constitutes a defense against murder charges if you claim that lighter trigger pull caused you to “accidentally” shoot three times, absolving them from culpability in the death of an innocent person. Beam me up Scotty. Sorry for straying, Mas. No problem, Dennis. I’m holding off on commentary in hopes that we’ll hear from some of the jurors as to just how their decisional process went during all those days of deliberation on the case. This article seems to suggest the jury did zero in on the gun. Judge refused to allow the jury to personally test the trigger pull hands on, resulting in them buying as fact, the defense’s contention that he found the gun “by accident” and pulled the trigger “by accident”, thus, could not be held accountable. Fruitbat, it depends on the gun. The two standards the court may look at are manufacturer specification for pull weight on a duty (as opposed to recreational) firearm, and the common custom and practice that has evolved over the years with the weapon in question when used for self-defense. Let’s look at three common self-defense handguns: the Glock, the 1911 pistol, and the double action revolver. Glock has made it clear in their literature and armorer’s classes that 5.5 pounds is their minimum acceptable trigger pull weight on a “duty” (i.e., self-defense) pistol. The 1911, a very different device with grip safety and thumb safety not found on striker-fired pistols such as the Glock, seems to have evolved to a 4.0 pound minimum pull weight. With a double action revolver, it is generally held that with the hammer cocked, there is a hair trigger in play, but not when the hammer is at rest in double action. Thank you for your reply Mas. The Handgun in question was s Sig-Sauer and the case in question was in fact the one Dennis mentioned. The article itself talked of the difference between proving first degree murder, deliberate intent with malice aforethought, and say, involuntary manslaughter involving acting in a criminally negligent way. This lighting problem will be solved in the future. Actually, anyone with enough money can solve it right now. Here’s what will happen; homeowner hears a noise during the night. He sits up in bed, reaches over and grabs the joystick controller to his robot. SWAT and the military already have these track-driven robots with guns and cameras mounted on them. Homeowner turns the robot on, and sends it toward the noise. The robot has a camera which is sending video to a monitor on the homeowner’s controller, so he can see what is in his house. He identifies the source of the noise. If it is friend, no further action taken by the robot. If it is a threat, the homeowner can use the joystick controller to shoot the threat with the robot-mounted gun. The homeowner is safe in his bedroom all through this encounter. Hurray for technology!